The Steven Spielberg film, “Jurassic World,” crashed onto the scene and smashed records in Hollywood and worldwide. In addition to having the largest worldwide opening in history grossing $524.4 million, it was also the first film to ever make more than $500 million in the first week. On June 22, 2015, “Jurassic World” became the fastest film to reach $1 billion ever according to the Internet Movie Database. The excitement of these achievements carried on even two weeks after the release with theaters still being packed across the country. But what’s the big deal about “Jurassic World” ? Is it truly worth the hype? Or is it just another crazy movie fad similar to the “Fast and Furious” series or “Twilight”? Overall, the movie delivers on excitement and action as well as providing enough nostalgia for fans of the original movies. Steven Spielberg is already in the Hollywood Hall of Fame for being a fantastic director with a creative mind who crafts exciting plots. Jurassic World is the fourth movie in the Jurassic Park film series, which began in 1993. The previous Jurassic movies were recognized for being pioneers in the computer generated film industry. Jurassic World upheld this standard with more than stellar graphics to make the dinosaurs lifelike and believable. Universal Pictures made the Jurassic World movie appeal to all audiences, as a great movie should. There was just enough science terminology and technological information to interest those who are really into Dinosaurs and genomes. Yet the information was not too high-tech and geeky to bore or confuse younger audiences or those simply not interested in the subject. There was just enough family struggle and relationship angst without making the film super cheesy. The plot was simple enough to enjoy. More blood and action but also had viewers leaving with thoughts on human greed. It showed how corporations/businesses have warped our thinking and understanding of nature. 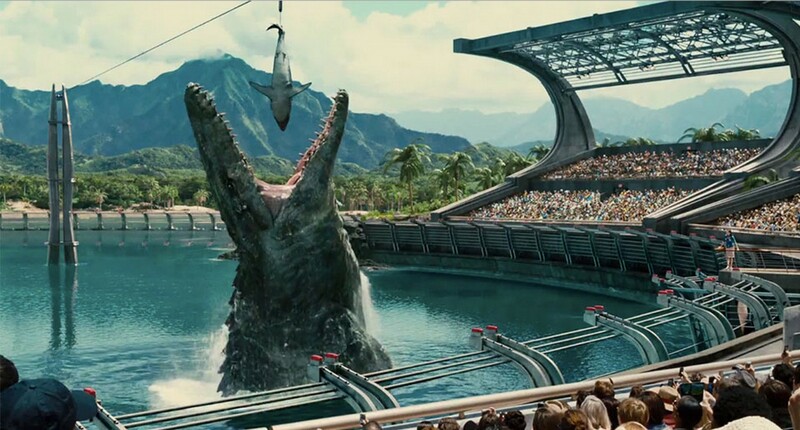 For fans of the past Jurassic Park movies, “Jurassic World” paid excellent homage to the movies that came before. The movie is definitely one that should be watched multiple times. There are many interesting nods to the old movies that might be missed on first view. Some viewers however complained that the Jurassic movies have taken the same format and have become predictable. Geryn Harris, a Junior Comprehensive Art major from Richmond, VA., said “It was…similar to the first [movie] as far as them being naive [and] a little predictable. But the action was still great.” For many who may not be as familiar with the movies, this particular point might not hamper the excitement of watching the movie and the film could still be considered a thoroughly enjoyable family film. Jurassic World was successful at least in conveying a message of social responsibility to its audiences. Many leaving the theaters couldn’t help but think about how humans have been the bane of existence to all creatures and nature since industrializing. While some may not be willing to pay the extra $5-$6 required to see the movie in Imax 3D, it can be assumed that the movie would have been made several times better. The picture quality and the images were beautiful. The dinosaurs were believable and the plot was enjoyable. Jurassic World may have done so well in theaters because of the memory of how well the other movies performed and people were excited to bring this next generation in to experience the magic. Thanks to the wild success of the film, there are already talks of a sequel. Many are already expressing a desire to see it, perhaps in Imax 3D this time.